Water is one of the most valuable resources in the world and is vital to all known forms of life. Oceans, seas and bays account for 96.5 percent of the global distribution of earth’s water resources while freshwater constitutes only about 1.2 percent of the earth’s surface. Driven by increased water needs in emerging markets—such as in China and India—global water demand is expected to rise to about 6,350 cubic kilometers in 2030. 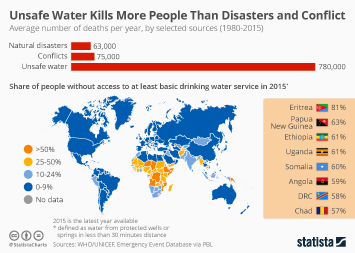 Safe drinking water, essential to humans and other life forms, is available to over 90 percent of the population in most areas of the world. But still, about 32 percent of the population in Africa is without access to improved sources of drinking water. Water also plays a very important role in the world’s economy - from manufacturing, to agriculture, to fishing, and global transportation of goods and services. In 2015, 43 percent of the global energy sector was heavily dependent on water and beef production required by far, the highest volume of water in the food production industry. In the United States, over 61,000 full-time employees were currently working in the water transportation industry in 2017. In addition to the provision of drinking water, the water industry also provides wastewater services to residential, commercial, and industrial sectors of the economy. The American Water Works was amongst the world’s largest diversified utility company as of 2018, with operating revenue of about 3.36 billion U.S. dollars. The water industry also includes manufacturers and suppliers of bottled water. The United States recorded a per capita consumption of bottled water totaling some 42.1 gallon in 2017. More interesting topics from the industry "Water & Wastewater"